Protect your optics from the elements even while keeping them easily accessable with Crooked Horn Outfitter's Bino Shield. Protect your optics from the elements even while keeping them easily accessable with Crooked Horn Outfitter&apos;s Bino Shield. Perfect companion to the Bino-System but will work with a traditional neck strap as well. Holds your binoculars tight to your chest. No more bouncing around. Cover and uncover your binoculars with ease. Simply wrap the elastic strap around your body and buckle it, then slip your binoculars into the Bino Shield as they hang from your existing harness or neck strap. The best way to keep your binoculars clean and dry. 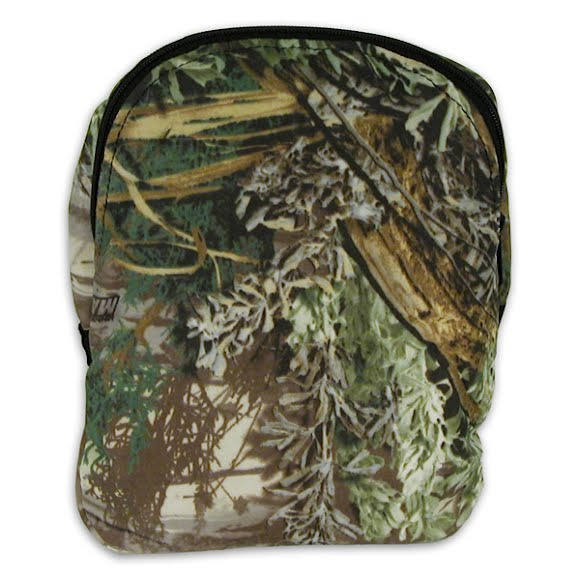 Handy zippered pocket is great for holding; licenses, calls, rangefinder or Bino-System. Doubles as a carrying case for your binoculars when not being worn. Real Tree Advantage Max-1 lets hunters in broad terrain melt into their surroundings. Max-1 camo combines the perfect balance of neutral earth tones, prairie grasses, brush, rock, sage and open zones with just a hint of shadow detail for added depth and realism.